he government yesterday said Speaker Karu Jayasuriya has no legal right to reconvene parliament today (14) and that it would make a decision this morning regarding its MPs and Ministers attending parliament. Minister Nimal Siripala De Silva said their counsels were still studying the Supreme Court’s interim order given suspending parliament dissolution. “After seeking legal opinion and having further discussion at our group leaders meeting this morning, we will make a decision about attending parliament sessions,” he told a news briefing. The group leaders meeting is scheduled to take place at 8.30 am in parliament complex today. Meanwhile, Minister Wimal Weerawansa said Speaker has no legal authority to convene parliament. “There is no legal recognition in this move. We reject it. 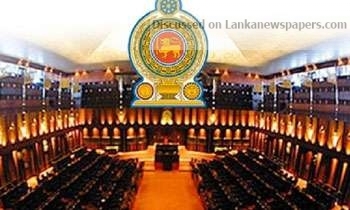 Speaker has called for the reconvening of parliament to satisfy a group of Opposition MPs and to show to the world that Sri Lanka is having a crisis,” he said. He said parliament remained dissolved since the interim order of Supreme Court has only suspended the gazette issued by the President dissolving parliament. “Unless the Supreme Court issues an order entirely cancelling the Gazette, parliament remains dissolved. Just because the Gazette was suspended, it doesn’t reverse the dissolution,” he said.